Following the publication of a Notice of impending expiry (1) of the anti-dumping measures in force on the imports of certain prepared or preserved sweetcorn in kernels originating in the Kingdom of Thailand (‘Thailand’), the European Commission (‘the Commission’) has received a request for review pursuant to Article 11(2) of Regulation (EU) 2016/1036 of the European Parliament and of the Council of 8 June 2016 on protection against dumped imports from countries not members of the European Union (2) (‘the basic Regulation’). The request was lodged on 13 June 2018 by the ‘association européenne des transformateurs de maïs doux’ (AETMD) (‘the applicant’) on behalf of producers representing more than 25 % of the total Union production of certain prepared or preserved sweetcorn in kernels. An open version of the request and the analysis of the degree of support by Union producers for the request are available in the file for inspection by interested parties. Section 5.5 of this Notice provides information about access to the file for interested parties. The product subject to this review is sweetcorn (Zea mays var. saccharata) in kernels, prepared or preserved by vinegar or acetic acid, not frozen and sweetcorn (Zea mays var. saccharata) in kernels prepared or preserved otherwise than by vinegar or acetic acid, not frozen, other than products of heading 2006, (‘the product under review’), currently falling within CN codes ex 2001 90 30 (TARIC code 2001903010) and ex 2005 80 00 (TARIC code 2005800010). The measures currently in force are a definitive anti-dumping duty imposed by Council Regulation (EU) No 875/2013 (3), as last amended by Council Regulation (EU) No 307/2014 (4). The request is based on the grounds that the expiry of the measures would be likely to result in continuation or recurrence of dumping and injury (5) to the Union industry. In the absence of reliable data on domestic prices for Thailand (‘the country concerned’) the allegation of likelihood of continuation or recurrence of dumping is based on a comparison of a constructed normal value (manufacturing costs, selling, general and administrative costs (SG&A) and profit) in Thailand with the export price (at ex-works level) of the product under review originating in Thailand when sold for export to the Union. On this basis the dumping margins calculated are significant for the country concerned. The applicant has provided sufficient evidence that the Union industry is still in a vulnerable state. The Union industry did not reach the target profit yet, especially in the retailer brands segment. The applicant also alleges the likelihood of recurrence of injury. In this respect the applicant has provided sufficient evidence that, should measures be allowed to lapse, the current import level of the product under review from the country concerned to the Union is likely to increase due to the existence of unused capacity/potential of the manufacturing facilities of the producers in Thailand. The applicant finally alleges that the improvement of the situation of the Union industry has been mainly due to the existence of measures and that any recurrence of substantial imports at dumped prices from the country concerned would likely lead to a recurrence of injury to the Union industry should measures be allowed to lapse. Having determined, after consulting the Committee established by Article 15(1) of the basic Regulation, that sufficient evidence exists to justify the initiation of an expiry review, the Commission hereby initiates a review in accordance with Article 11(2) of the basic Regulation. The expiry review will determine whether the expiry of the measures would be likely to lead to a continuation or recurrence of dumping of the product under review originating in the country concerned and a continuation or recurrence of injury to the Union industry. As already announced (6), the so-called TDI Modernisation package (Regulation (EU) 2018/825 of the European Parliament and of the Council which entered into force on 8 June 2018 (7)) introduced, among other things, significant changes to the timetable and deadlines previously applicable in anti-dumping proceedings. The time limits for interested parties to come forward, in particular at the early stage of investigations, are shortened. The timetable for this investigation, as set out in this Notice, includes specific instructions for the submission of information at various stages of the investigation and the organisation of hearings. Requests for extensions to deadlines will also be made stricter. The investigation of a continuation or recurrence of dumping will cover the period from 1 July 2017 to 30 June 2018 (‘the review investigation period’). The examination of trends relevant for the assessment of the likelihood of recurrence of injury will cover the period from 1 January 2015 to the end of the review investigation period (‘the period considered’). In an expiry review, the Commission examines exports that were made to the Union in the review investigation period and, irrespective of exports to the Union, considers whether the situation of the companies producing and selling the product under review in the country concerned is such that continuation or recurrence of exports at dumped prices to the Union would be likely to continue or recur if measures expire. Therefore, all producers (8) of the product under review in the country concerned, irrespective of whether or not they exported the product under review to the Union in the review investigation period, are invited to participate in the Commission investigation. In view of the potentially large number of producers in Thailand involved in this expiry review and in order to complete the investigation within the statutory time limits, the Commission may limit the producers to be investigated to a reasonable number by selecting a sample (this process is also referred to as ‘sampling’). The sampling will be carried out in accordance with Article 17 of the basic Regulation. 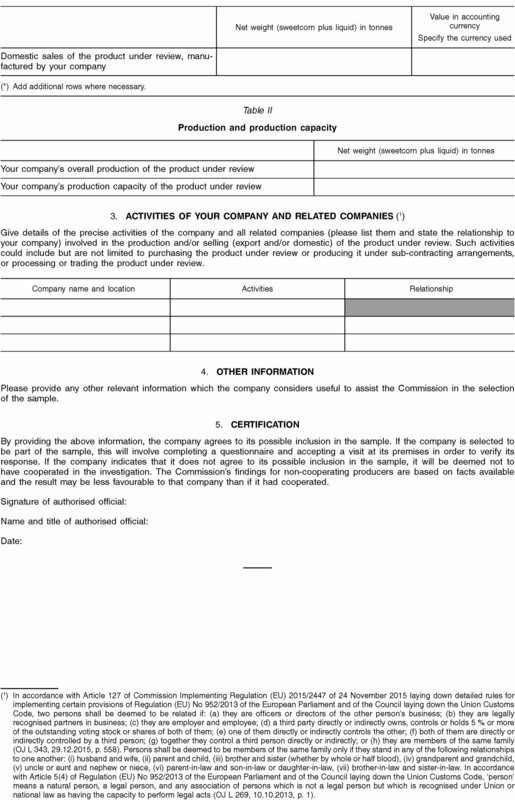 In order to enable the Commission to decide whether sampling is necessary, and if so, to select a sample, all producers, or representatives acting on their behalf, including the ones who did not cooperate in the investigation leading to the measures subject to this review, are hereby requested to provide the Commission with information on their company(ies) requested in Annex I to this Notice within 7 days of the date of publication of this Notice. In order to obtain the information it deems necessary for the selection of the sample of producers in the country concerned, the Commission will also contact the authorities of Thailand and may contact any known associations of producers in the country concerned. If a sample is necessary, the producers will be selected based on the largest representative volume of production, sales or exports which can reasonably be investigated within the time frame available. All known producers in the country concerned, the authorities of the country concerned and associations of producers in the country concerned will be notified by the Commission, via the authorities of the country concerned if appropriate, of the companies selected to be in the sample. Once the Commission has received the necessary information to select a sample of producers, it will inform the parties concerned of its decision whether they are included in the sample. The sampled producers will have to submit a completed questionnaire within 30 days from the date of notification of the decision of their inclusion in the sample, unless otherwise specified. The Commission will add a note to the file for inspection by interested parties reflecting the sample selection. Any comment on the sample selection must be received within 3 days of the date of notification of the sample decision. A copy of the questionnaire for producers in the country concerned is available in the file for inspection by interested parties and on DG Trade's website (http://trade.ec.europa.eu/tdi/case_details.cfm?id=2362). The questionnaire will also be made available to any known association of producers, and to the authorities of the country concerned. Without prejudice to the possible application of Article 18 of the basic Regulation, companies that have agreed to their possible inclusion in the sample but are not selected to be in the sample will be considered to be cooperating (‘non-sampled cooperating producers’). Unrelated importers of the product under review from the country concerned to the Union, including those that did not cooperate in the investigation leading to the measures in force, are invited to participate in this investigation. In view of the potentially large number of unrelated importers involved in this expiry review and in order to complete the investigation within the statutory time limits, the Commission may limit to a reasonable number the unrelated importers that will be investigated by selecting a sample (this process is also referred to as ‘sampling’). The sampling will be carried out in accordance with Article 17 of the basic Regulation. 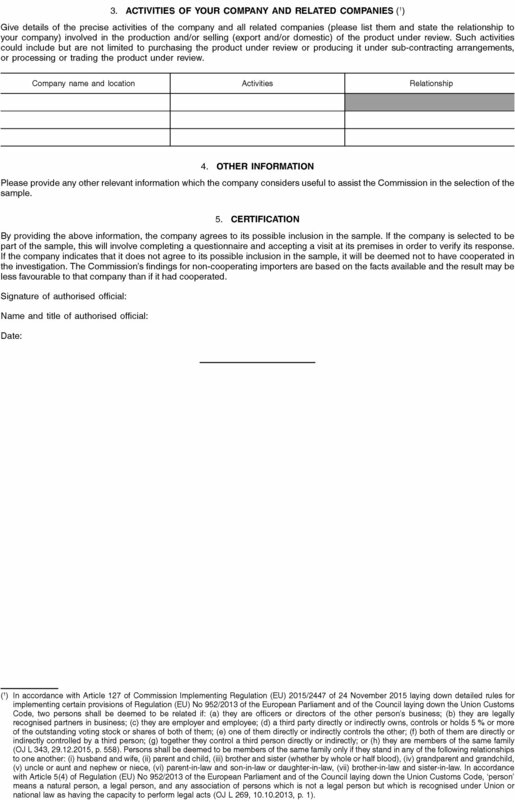 In order to enable the Commission to decide whether sampling is necessary and, if so, to select a sample, all unrelated importers, or representatives acting on their behalf, including the ones who did not cooperate in the investigation leading to the measures subject to the present review, are hereby requested to make themselves known to the Commission. Those parties must do so within 7 days of the date of publication of this Notice by providing the Commission with the information on their company(ies) requested in Annex II. If a sample is necessary, the importers may be selected based on the largest representative volume of sales of the product under review from the country concerned in the Union which can reasonably be investigated within the time available. All known unrelated importers and associations of importers will be notified by the Commission of the companies selected to be in the sample. The Commission will also add a note to the file for inspection by interested parties reflecting the sample selection. Any comment on the sample selection must be received within 3 days of the date of notification of the sample decision. In order to obtain the information it deems necessary for its investigation, the Commission will send questionnaires to the sampled unrelated importers. Those parties must submit a completed questionnaire within 30 days from the date of the notification of the sample selection, unless otherwise specified. A copy of the questionnaire for unrelated importers is available in the file for inspection by interested parties and on DG Trade's website (http://trade.ec.europa.eu/tdi/case_details.cfm?id=2362). In order to establish whether there is a likelihood of a continuation or recurrence of injury to the Union industry, Union producers of the product under review are invited to participate in the Commission investigation. In view of the large number of Union producers involved in this expiry review and in order to complete the investigation within the statutory time limits, the Commission has decided to limit to a reasonable number the Union producers that will be investigated by selecting a sample (this process is also referred to as ‘sampling’). The sampling is carried out in accordance with Article 17 of the basic Regulation. The Commission has provisionally selected a sample of Union producers. Details can be found in the file for inspection by interested parties. Interested parties are hereby invited to consult the file (for this they should contact the Commission using the contact details provided in Section 5.8 below). Other Union producers, or representatives acting on their behalf, including Union producers who did not cooperate in the investigation leading to the measures in force, that consider that there are reasons why they should be included in the sample must contact the Commission within 7 days of the date of publication of this Notice. All interested parties wishing to submit any other relevant information regarding the selection of the sample must do so within 7 days of the publication of this Notice, unless otherwise specified. A copy of the questionnaire for Union producers is available in the file for inspection by interested parties and on DG Trade's website (http://trade.ec.europa.eu/tdi/case_details.cfm?id=2362). Should the likelihood of continuation or recurrence of dumping and injury be confirmed, a decision will be reached, pursuant to Article 21 of the basic Regulation, as to whether maintaining the anti-dumping measures would not be against the Union interest. Union producers, importers and their representative associations, users and their representative associations, trade unions and representative consumer organisations are invited to provide the Commission with information on the Union interest. In order to participate in the investigation, the representative consumer organisations have to demonstrate that there is an objective link between their activities and the product under review. Information concerning the assessment of Union interest must be provided within 37 days of the date of publication of this Notice unless otherwise specified. This information may be provided either in a free format or by completing a questionnaire prepared by the Commission. A copy of the questionnaires, including the questionnaire for users of the product under review, is available in the file for inspection by interested parties and on DG Trade's website (http://trade.ec.europa.eu/tdi/case_details.cfm?id=2362). In any case, information submitted pursuant to Article 21 will only be taken into account if supported by factual evidence at the time of submission. In order to participate in the investigation interested parties, such as producers in the country concerned, Union producers, importers and their representative associations, users and their representative associations, trade unions and representative consumer organisations first have to demonstrate that there is an objective link between their activities and the product under review. Producers in the country concerned, Union producers, importers and representative associations who made information available in accordance to the procedures described in Sections 5.2, 5.3 and 5.4 will be considered as interested parties if there is an objective link between their activities and the product under review. Other parties will only be able to participate in the investigation as interested party from the moment they make themselves known, and provided that there is an objective link between their activities and the product under review. Being considered as an interested party is without prejudice to the application of Article 18 of the basic Regulation. Access to the file available for inspection for interested parties is made via Tron.tdi at the following address: https://webgate.ec.europa.eu/tron/TDI Please follow the instructions on that page to get access. Subject to the provisions of this Notice, all interested parties are hereby invited to make their views known, submit information and provide supporting evidence. Unless otherwise specified, this information and supporting evidence must reach the Commission within 37 days of the date of publication of this Notice. All interested parties may request to be heard by the Commission investigation services. Any request to be heard must be made in writing and must specify the reasons for the request as well as a summary of what the interested party wishes to discuss during the hearing. The hearing will be limited to the issues set out by the interested parties in writing beforehand. Information submitted to the Commission for the purpose of trade defence investigations shall be free from copyrights. Interested parties, before submitting to the Commission information and/or data which is subject to third-party copyrights, must request specific permission to the copyright holder explicitly allowing (a) the Commission to use the information and data for the purpose of this trade defence proceeding; and (b) to provide the information and/or data to interested parties to this investigation in a form that allows them to exercise their rights of defence. All written submissions, including the information requested in this Notice, completed questionnaires and correspondence provided by interested parties for which confidential treatment is requested shall be labelled ‘Limited’ (11). Parties submitting information in the course of this investigation are invited to reason their request for confidential treatment. Interested parties providing ‘Limited’ information are required to furnish non-confidential summaries of it pursuant to Article 19(2) of the basic Regulation, which will be labelled ‘For inspection by interested parties’. These summaries must be sufficiently detailed to permit a reasonable understanding of the substance of the information submitted in confidence. If a party providing confidential information fails to show good cause for a confidential treatment request or does not furnish a non-confidential summary of it in the requested format and quality, the Commission may disregard such information unless it can be satisfactorily demonstrated from appropriate sources that the information is correct. Interested parties are invited to make all submissions and requests by email including scanned powers of attorney and certification sheets, with the exception of voluminous replies which shall be submitted on a CD-ROM or DVD by hand or by registered mail. By using email, interested parties express their agreement with the rules applicable to electronic submissions contained in the document ‘CORRESPONDENCE WITH THE EUROPEAN COMMISSION IN TRADE DEFENCE CASES’ published on the website of the Directorate-General for Trade: http://trade.ec.europa.eu/doclib/docs/2011/june/tradoc_148003.pdf The interested parties must indicate their name, address, telephone and a valid email address and they should ensure that the provided email address is a functioning official business email which is checked on a daily basis. Once contact details are provided, the Commission will communicate with interested parties by email only, unless they explicitly request to receive all documents from the Commission by another means of communication or unless the nature of the document to be sent requires the use of a registered mail. For further rules and information concerning correspondence with the Commission including principles that apply to submissions by email, interested parties should consult the communication instructions with interested parties referred to above. The investigation shall normally be concluded within 12 months and in any event no later than 15 months from the date of the publication of this Notice, pursuant to Article 11(5) of the basic Regulation. As a rule, interested parties may only submit information in the time frames specified in Section 5 of this Notice. Comments on the information provided by other interested parties in reaction to the disclosure of the definitive findings should be submitted within 3 days from the deadline to comment on the definitive findings, unless otherwise specified. If there is an additional final disclosure, comments filed by other interested parties in reaction to this further disclosure should be made within 1 day from the deadline to comment on this further disclosure, unless otherwise specified. The outlined time frame is without prejudice to the Commission's right to request additional information from interested parties in duly justified cases. Extensions to the deadline to reply to questionnaires may be granted, if duly justified, and will be normally limited to 3 additional days. As a rule, such extensions will not exceed 7 days. Regarding time limits for the submission of other information specified in this Notice, extensions will be limited to 3 days unless exceptional circumstances are demonstrated. In cases where any interested party refuses access to or does not provide the necessary information within the time limits, or significantly impedes the investigation, findings, affirmative or negative, may be made on the basis of facts available, in accordance with Article 18 of the basic Regulation. If an interested party does not cooperate or cooperates only partially and findings are therefore based on facts available in accordance with Article 18 of the basic Regulation, the result may be less favourable to that party than if it had cooperated. The Hearing Officer may organise hearings and mediate between the interested party/-ies and Commissions services to ensure that the interested parties' rights of defence are being fully exercised. A request for a hearing with the Hearing Officer should be made in writing and should specify the reasons for the request. The Hearing Officer will examine the reasons for the requests. These hearings should only take place if the issues have not been settled with the Commission services in due course. Any request must be submitted in good time and expeditiously so as not to jeopardise the orderly conduct of proceedings. To that effect, interested parties should request the intervention of the Hearing Officer at the earliest possible time following the occurrence of the event justifying such intervention. Where hearing requests are submitted outside the relevant time frames, the Hearing Officer will also examine the reasons for such late requests, the nature of the issues raised and the impact of those issues on the rights of defence, having due regard to the interests of good administration and the timely completion of the investigation. As this expiry review is initiated in accordance with the provisions of Article 11(2) of the basic Regulation, the findings thereof will not lead to the existing measures being amended but will lead to those measures being repealed or maintained in accordance with Article 11(6) of the basic Regulation. If any interested party considers that a review of the measures is warranted so as to allow for the possibility to amend the measures, that party may request a review pursuant to Article 11(3) of the basic Regulation. Any personal data collected in this investigation will be treated in accordance with Regulation (EC) No 45/2001 of the European Parliament and of the Council (12). (1) OJ C 440, 21.12.2017, p. 21. (2) OJ L 176, 30.6.2016, p. 21. (3) Council Implementing Regulation (EU) No 875/2013 of 2 September 2013 imposing a definitive anti-dumping duty on imports of certain prepared or preserved sweetcorn in kernels originating in Thailand following an expiry review pursuant to Article 11(2) of Regulation (EC) No 1225/2009 (OJ L 244, 13.9.2013, p. 1). (4) Council Implementing Regulation (EU) No 307/2014 of 24 March 2014 amending Implementing Regulation (EU) No 875/2013 imposing a definitive anti-dumping duty on imports of certain prepared or preserved sweetcorn in kernels originating in Thailand following an interim review pursuant of Article 11(3) of Regulation (EC) No 1225/2009 (OJ L 91, 27.3.2014, p. 1). (5) The general term ‘injury’ refers to material injury as well as to threat of material injury or material retardation of the establishment of an industry as set out in Article 3(1) of the basic Regulation. (7) Regulation (EU) 2018/825 of the European Parliament and of the Council of 30 May 2018 amending Regulation (EU) 2016/1036 on protection against dumped imports from countries not members of the European Union and Regulation (EU) 2016/1037 on protection against subsidised imports from countries not members of the European Union (OJ L 143, 7.6.2018, p. 1). (8) A producer is any company in the country concerned which produces the product under review, including any of its related companies involved in the production, domestic sales or exports of the product under review. (9) Only importers not related to producers in the country concerned can be sampled. Importers that are related to producers in the countries concerned have to fill in Annex I to the questionnaire for these producers. In accordance with Article 127 of Commission Implementing Regulation (EU) 2015/2447 of 24 November 2015 laying down detailed rules for implementing certain provisions of Regulation (EU) No 952/2013 of the European Parliament and of the Council laying down the Union Customs Code, two persons shall be deemed to be related if: (a) they are officers or directors of the other person's business; (b) they are legally recognised partners in business; (c) they are employer and employee; (d) a third party directly or indirectly owns, controls or holds 5 % or more of the outstanding voting stock or shares of both of them; (e) one of them directly or indirectly controls the other; (f) both of them are directly or indirectly controlled by a third person; (g) together they control a third person directly or indirectly; or (h) they are members of the same family (OJ L 343, 29.12.2015, p. 558). Persons shall be deemed to be members of the same family only if they stand in any of the following relationships to one another: (i) husband and wife, (ii) parent and child, (iii) brother and sister (whether by whole or half blood), (iv) grandparent and grandchild, (v) uncle or aunt and nephew or niece, (vi) parent-in-law and son-in-law or daughter-in-law, (vii) brother-in-law and sister-in-law. In accordance with Article 5(4) of Regulation (EU) No 952/2013 of the European Parliament and of the Council laying down the Union Customs Code, ‘person’ means a natural person, a legal person, and any association of persons which is not a legal person but which is recognised under Union or national law as having the capacity to perform legal acts (OJ L 269, 10.10.2013, p. 1). (10) The data provided by unrelated importers may also be used in relation to aspects of this investigation other than the determination of dumping. (11) A ‘Limited’ document is a document which is considered confidential pursuant to Article 19 of the basic Regulation and Article 6 of the WTO Agreement on Implementation of Article VI of the GATT 1994 (Anti-Dumping Agreement). It is also a document protected pursuant to Article 4 of Regulation (EC) No 1049/2001 of the European Parliament and of the Council (OJ L 145, 31.5.2001, p. 43). 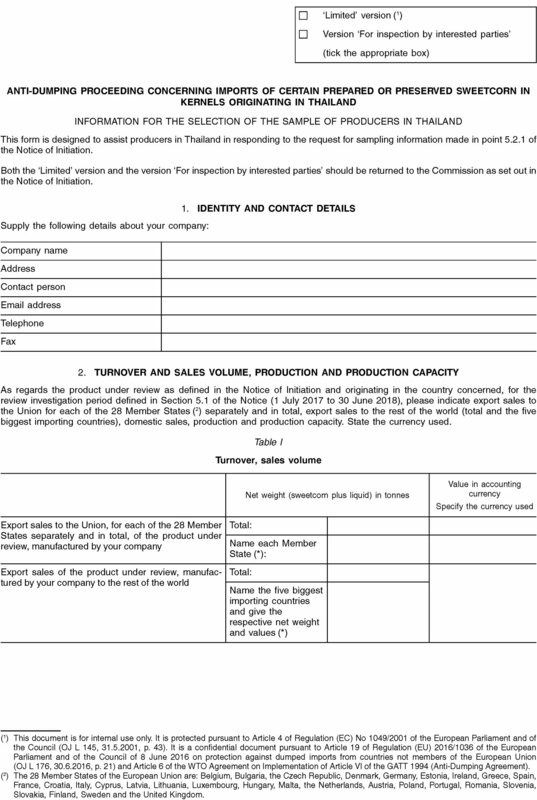 This form is designed to assist producers in Thailand in responding to the request for sampling information made in point 5.2.1 of the Notice of Initiation. Both the ‘Limited’ version and the version ‘For inspection by interested parties’ should be returned to the Commission as set out in the Notice of Initiation. As regards the product under review as defined in the Notice of Initiation and originating in the country concerned, for the review investigation period defined in Section 5.1 of the Notice (1 July 2017 to 30 June 2018), please indicate export sales to the Union for each of the 28 Member States (2) separately and in total, export sales to the rest of the world (total and the five biggest importing countries), domestic sales, production and production capacity. State the currency used. (1) This document is for internal use only. It is protected pursuant to Article 4 of Regulation (EC) No 1049/2001 of the European Parliament and of the Council (OJ L 145, 31.5.2001, p. 43). It is a confidential document pursuant to Article 19 of Regulation (EU) 2016/1036 of the European Parliament and of the Council of 8 June 2016 on protection against dumped imports from countries not members of the European Union (OJ L 176, 30.6.2016, p. 21) and Article 6 of the WTO Agreement on Implementation of Article VI of the GATT 1994 (Anti-Dumping Agreement). (2) The 28 Member States of the European Union are: Belgium, Bulgaria, the Czech Republic, Denmark, Germany, Estonia, Ireland, Greece, Spain, France, Croatia, Italy, Cyprus, Latvia, Lithuania, Luxembourg, Hungary, Malta, the Netherlands, Austria, Poland, Portugal, Romania, Slovenia, Slovakia, Finland, Sweden and the United Kingdom. Give details of the precise activities of the company and all related companies (please list them and state the relationship to your company) involved in the production and/or selling (export and/or domestic) of the product under review. Such activities could include but are not limited to purchasing the product under review or producing it under sub-contracting arrangements, or processing or trading the product under review. By providing the above information, the company agrees to its possible inclusion in the sample. If the company is selected to be part of the sample, this will involve completing a questionnaire and accepting a visit at its premises in order to verify its response. If the company indicates that it does not agree to its possible inclusion in the sample, it will be deemed not to have cooperated in the investigation. The Commission’s findings for non-cooperating producers are based on facts available and the result may be less favourable to that company than if it had cooperated. (1) In accordance with Article 127 of Commission Implementing Regulation (EU) 2015/2447 of 24 November 2015 laying down detailed rules for implementing certain provisions of Regulation (EU) No 952/2013 of the European Parliament and of the Council laying down the Union Customs Code, two persons shall be deemed to be related if: (a) they are officers or directors of the other person’s business; (b) they are legally recognised partners in business; (c) they are employer and employee; (d) a third party directly or indirectly owns, controls or holds 5 % or more of the outstanding voting stock or shares of both of them; (e) one of them directly or indirectly controls the other; (f) both of them are directly or indirectly controlled by a third person; (g) together they control a third person directly or indirectly; or (h) they are members of the same family (OJ L 343, 29.12.2015, p. 558). Persons shall be deemed to be members of the same family only if they stand in any of the following relationships to one another: (i) husband and wife, (ii) parent and child, (iii) brother and sister (whether by whole or half blood), (iv) grandparent and grandchild, (v) uncle or aunt and nephew or niece, (vi) parent-in-law and son-in-law or daughter-in-law, (vii) brother-in-law and sister-in-law. In accordance with Article 5(4) of Regulation (EU) No 952/2013 of the European Parliament and of the Council laying down the Union Customs Code, ‘person’ means a natural person, a legal person, and any association of persons which is not a legal person but which is recognised under Union or national law as having the capacity to perform legal acts (OJ L 269, 10.10.2013, p. 1). This form is designed to assist unrelated importers in responding to the request for sampling information made in point 5.2.2 of the Notice of Initiation. 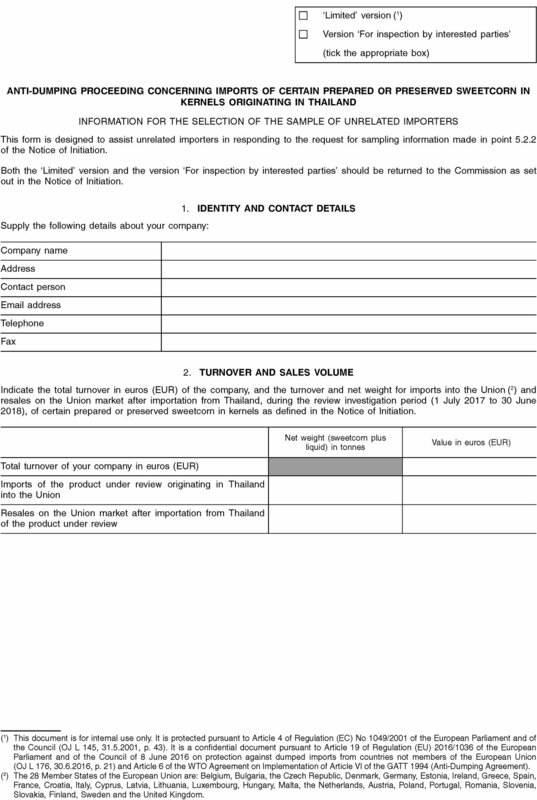 Indicate the total turnover in euros (EUR) of the company, and the turnover and net weight for imports into the Union (2) and resales on the Union market after importation from Thailand, during the review investigation period (1 July 2017 to 30 June 2018), of certain prepared or preserved sweetcorn in kernels as defined in the Notice of Initiation. By providing the above information, the company agrees to its possible inclusion in the sample. If the company is selected to be part of the sample, this will involve completing a questionnaire and accepting a visit at its premises in order to verify its response. If the company indicates that it does not agree to its possible inclusion in the sample, it will be deemed not to have cooperated in the investigation. The Commission’s findings for non-cooperating importers are based on the facts available and the result may be less favourable to that company than if it had cooperated.